02. After all the birthday excitement and getting over the sniffles, this weekend has been a mixture of shopping and sleeping. My two favourite things! I’ve picked up a new makeup bag and some bits for my room as Tiger has recently made its way to Brighton and I’ve been dying to have a mooch around! I only grabbed a couple of pieces for myself but it’s made me very excited for the other half to finish uni so we can finally move out and start filling up our own space with new bits and bobs. 03. This afternoon the boy and I stopped by my favourite Cafe in Hove. Ethels kitchen never fails and results in a guaranteed food coma every time. 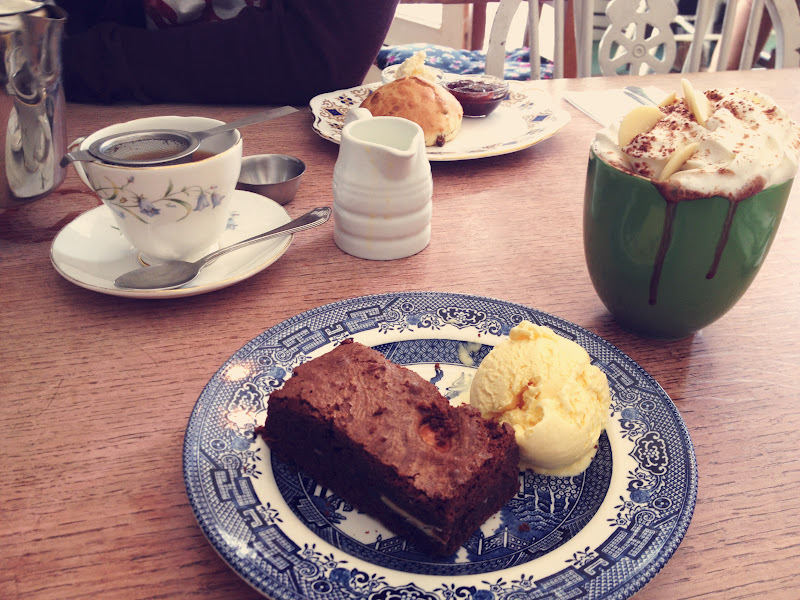 This week I went for their organic brownie and ice cream with a white button hot chocolate on the side… Can you say Sugar Coma? Oh and Josh would probably want me to tell you he had the Cream Tea. Yeah, I know, I go food fatty foods and he picks a nice dainty pud… Backwards. 04. Despite the crazy that is going to occur this week, I’m actually very excited. Especially for Saturday and Sunday in London. It’s one of my favourite places and my best friend knows it, so for my birthday she booked a trip to London for shopping and spa treatments. No one can say she doesn’t know me well! It also means I get to go on the train… I love trains! Oh my god, that brownie looks absolutely delicious!! Hope you had a good birthday despite the illness!